After my Mildew article last week, I realized my Rambler publications had reached an all time low. As one excavates deeper and deeper into the baseness of human existence, one, like Augustine, will have a dramatic conversion. Thus, I will now proceed to write a serious article. So, for those of you without the ability to read serious things (such as I), do not read further. Throughout my life, I’ve had a problem with liking things. Specifically, liking things that are good and beautiful. I’ve gotten better with effort. But still, whether it be my sins, the culture, bad friends, or something unknown, I have a real problem with appreciating a truly beautiful, good thing. Maybe that’s not true. But somehow, I’m immediately turned off to something that another person enjoys – initially, at least. But I’ve gotten better. Through effort, through some prayer, through some thoughtfulness and personal experience, I’ve suddenly inclined my head and seen something anew and understood what the big deal was. Normally, I tend to get distracted, sometimes by pretty trivial things that no one else notices. Other people, simpler people, see and awe at the big picture, while I get bogged down on the details and miss the overall point. At the same time, I pride myself in noticing these overlooked details. On the other hand, I am envious of simpler people’s more profound knowledge. In Rome, specifically, I’ve encountered this phenomenon. Going from basilica to basilica, I see people’s faces in their wonder. I appreciate the artwork as well, but with a more forced spirit. People look up in awe, and I look down in discomfort. I cannot ascend to the higher appreciation of beauty – I just look at the floor. But the floors of basilicas are very beautiful. They do tend to be the more meaningless parts of churches, but that’s not so bad. Their “cosmotesque” designs are inoffensive geometrical decorations that even the atheist would like. They do not try to express any dogma. They do not force upon one a supernatural guilt-trip and sense of unworthiness. They are the basest of decorations, the most humble, for they are trampled underfoot. Like humility, the floor is a good foundation for everything else. 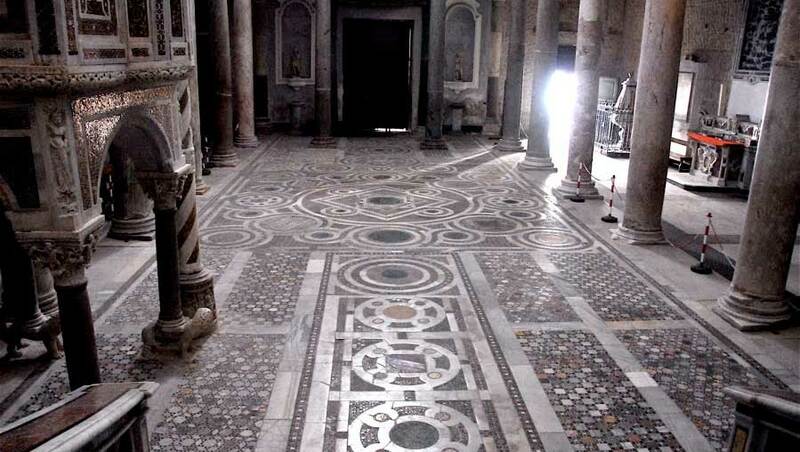 It one day struck me that these marble designs lay on the floor as if prostrate, as if to indicate all creation, no matter how low, gives praise to the Christ. I don’t know how I arrived at this. I then thought, if these beautiful things glorify the Creator, they have something in common with these statues of the saints. I could then understand the statues in a new light, who had actual faces that look toward the altar, their hands pointing inward to their hearts. I could start to understand the church as a whole. I could understand them to their domes and to their spires that stretch up to heaven like spiritual antennae. My father, this week, came to Rome to visit me. We climbed the holy steps on our knees – the holy steps brought over from Jerusalem that Christ ascended when condemned to die by the decree of Pontius Pilate. I realized later that Christ actually ascended those steps. Here in Rome you … daresay, take for granted all these relics … and personally I forget to realize that Christianity is true – that God is real. Even so in Rome. The Holy steps are now covered in wood lest the pilgrims continue to wear it down, but certain spots of it can be seen through holes in the wood protected by glass, against which people touch their rosaries. Through those holes you can see the faint stains of Christ’s blood. Even now my eyes water. I’ve never felt this way. For most of my Catholic life I’ve prayed for some heartfelt reaction to the passion, and this now has happened. Next to the holy steps there’s a statue of Christ at the Agony of the Garden, kneeling on a stone, looking up to heaven, and shedding a tear. Even a year or so ago I would not have felt anything at this. Here in Rome, I have learnt the startling thing that Christ is a person. Even a couple years ago, if I read those words I would feel nothing. I would be bored by them. I would have heard them before in other ways from so many other people that seemed to get it. But recently, the Gospel was the parable of the lady going to the unjust judge, showing how if one can sway an unjust person by constant requests, one can sway God who is just with even greater ease by perseverance in prayer. I’ve been trying to figure out how to attain some personal relationship with Christ because I saw it in other people, though not in me at all. I prayed and prayed and eventually it clicked. That’s how prayer works. It’s hard and miserable and frustrating and no one likes it, but the saints show how it can be done. And, the scary thing is, all prayers are answered. I had been seeing Christ too much as a concept. Christ is a person. I don’t know how I came to realize that. It was too obvious to notice in my case. Too clichéd almost. But, think of people and friends you admire, and think of their qualities, and think how you think about them. In some scary way, that’s how you should think about Christ. It’s scary, I think, because Christ has seemed this distant abstract mystical thing, an ideal and all good, but hard to love, while in fact, he is very personal, like an actual friend – a really good friend – who cries for you, who suffers for you when you don’t know it but suffers anyway. You don’t understand. You don’t understand what the passion is for. But he suffers anyway. And you don’t care. But like the floor, be humble. Be humble and honest. Humility is the foundation of all virtue. In prayer be humble and lay out on the ground what is on your heart, and God will purify those desires. Even if progress does not seem to happen, be humble again, knowing that you are too small to see everything, and so keep praying. Be humble and open and let the Architect work his designs, and he will build a basilica for your soul.